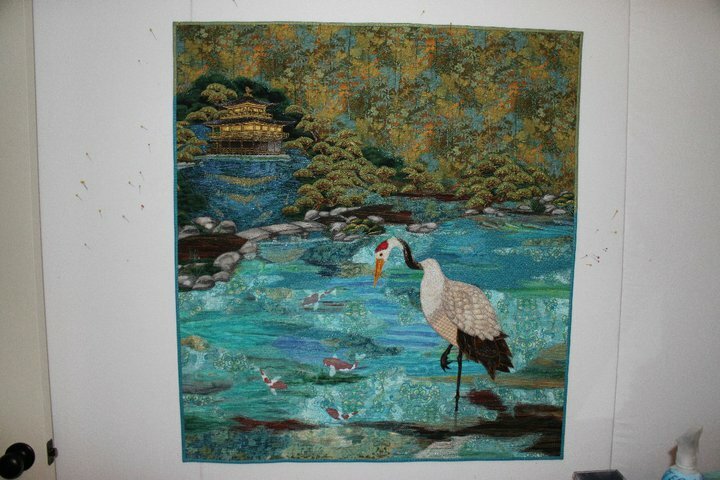 One of the pilots in SCOH is married to the talented Judy Williams Beskow who just won the Hoffman Challenge for her latest quilt. It’s gorgeous and clever. The challenge fabric has a swirly blue and green, impressionistic pattern that looks like flowers – but could be bubbly water. 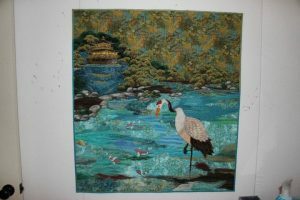 To depict carp at different depths in the pool, she layered mesh over them; she quilted each of the Red-Crested Crane’s feathers separately. And she did the piece in two months, in a blaze of inspiration while navigating through a couple of crises in the family. Inspiration works like that sometimes – it becomes the flow you go to when life is hard.